The government requires hedge funds and wealthy investors that crossed the $100 million equity holdings threshold are required to file a report that shows their positions at the end of every quarter. Even though it isn’t the intention, these filings level the playing field for ordinary investors. The latest round of 13F filings disclosed the funds’ positions on December 31. We at Insider Monkey have made an extensive database of nearly 750 of those elite funds and prominent investors’ filings. In this article, we analyze how these elite funds and prominent investors traded Copart, Inc. (NASDAQ:CPRT) based on those filings. Copart, Inc. (NASDAQ:CPRT) was in 28 hedge funds’ portfolios at the end of December. CPRT shareholders have witnessed a decrease in hedge fund sentiment lately. There were 31 hedge funds in our database with CPRT holdings at the end of the previous quarter. Our calculations also showed that CPRT isn’t among the 30 most popular stocks among hedge funds. 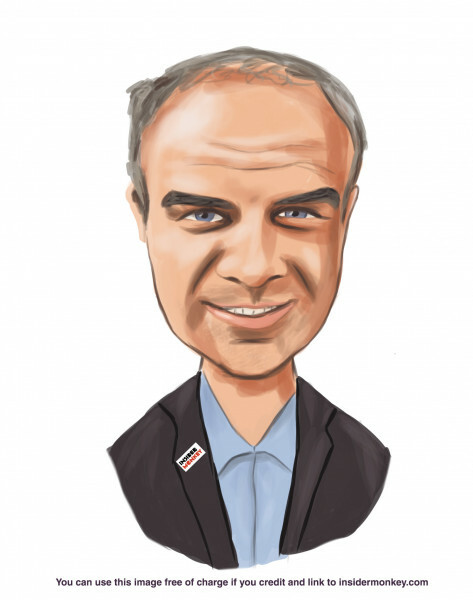 We’re going to go over the new hedge fund action encompassing Copart, Inc. (NASDAQ:CPRT). Heading into the first quarter of 2019, a total of 28 of the hedge funds tracked by Insider Monkey were bullish on this stock, a change of -10% from one quarter earlier. 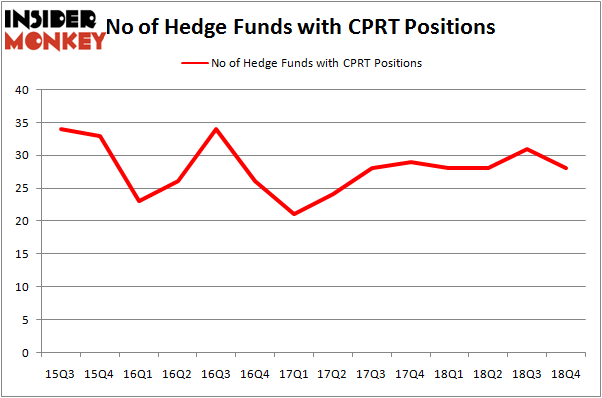 On the other hand, there were a total of 28 hedge funds with a bullish position in CPRT a year ago. With the smart money’s sentiment swirling, there exists a few noteworthy hedge fund managers who were upping their stakes considerably (or already accumulated large positions). Among these funds, Palestra Capital Management held the most valuable stake in Copart, Inc. (NASDAQ:CPRT), which was worth $125.9 million at the end of the third quarter. On the second spot was Suvretta Capital Management which amassed $38.2 million worth of shares. Moreover, Nitorum Capital, Arrowstreet Capital, and AQR Capital Management were also bullish on Copart, Inc. (NASDAQ:CPRT), allocating a large percentage of their portfolios to this stock. Because Copart, Inc. (NASDAQ:CPRT) has faced a decline in interest from the entirety of the hedge funds we track, it’s safe to say that there was a specific group of funds who were dropping their positions entirely heading into Q3. At the top of the heap, Jonathan Lourie and Stuart Fiertz’s Cheyne Capital said goodbye to the largest investment of the 700 funds watched by Insider Monkey, worth about $4.6 million in stock, and George Hall’s Clinton Group was right behind this move, as the fund dropped about $4.4 million worth. These moves are intriguing to say the least, as aggregate hedge fund interest was cut by 3 funds heading into Q3. Let’s now review hedge fund activity in other stocks – not necessarily in the same industry as Copart, Inc. (NASDAQ:CPRT) but similarly valued. We will take a look at Textron Inc. (NYSE:TXT), E*TRADE Financial Corporation (NASDAQ:ETFC), Comerica Incorporated (NYSE:CMA), and Vistra Energy Corp. (NYSE:VST). This group of stocks’ market caps resemble CPRT’s market cap. As you can see these stocks had an average of 37.25 hedge funds with bullish positions and the average amount invested in these stocks was $1430 million. That figure was $273 million in CPRT’s case. Vistra Energy Corp. (NYSE:VST) is the most popular stock in this table. On the other hand Textron Inc. (NYSE:TXT) is the least popular one with only 28 bullish hedge fund positions. Compared to these stocks Copart, Inc. (NASDAQ:CPRT) is even less popular than TXT. Considering that hedge funds aren’t fond of this stock in relation to other companies analyzed in this article, it may be a good idea to analyze it in detail and understand why the smart money isn’t behind this stock. This isn’t necessarily bad news. Although it is possible that hedge funds may think the stock is overpriced and view the stock as a short candidate, they may not be very familiar with the bullish thesis. In either case more research is warranted. Our calculations showed that top 15 most popular stocks among hedge funds returned 19.7% through March 15th and outperformed the S&P 500 ETF (SPY) by 6.6 percentage points. A handful of hedge funds were also right about betting on CPRT as the stock returned 23.5% and outperformed the market as well. You can see the entire list of these shrewd hedge funds here.